I would love to say I felt the magic of Camp-8 right when I arrived, but that was far from reality. After being towed behind a snow machine across the Matthes Glacier in a whiteout, we came to a halt on the edge of a slope. Newt told us that the snow machine had gone as far as it would go, and it was time to ski up from there. Still completely disoriented as to where I was, I started switchbacking up the slope until we reached the nunatak that Camp-8 was on. Dropping our skis and boot-packing to the top, we couldn’t wait to see our new home for the next two days. We opened up the door to a musty smelling one-room building with four bunks, a table, and a kitchen fully equipped with a waffle maker. We didn’t get to stay too long at first, because at the bottom of the nunatak sat the sled full of food and four tanks of propane. We headed back down, filling our empty packs with all the food and supplies we could, and grabbing a propane tank each. Slowly but surely, we made our way back up to camp. Magical yet? Not in the slightest, but as with most things that are worthwhile, you’ve got to work a little bit to achieve them. Arriving back at camp, and still only able to see about a meter in front of us, we tucked away inside our new home and finished all of our camp opening chores. Camp-8 when we first arrived. Photo by Kenzie McAdams. After we finished cleaning, we stepped outside and the clouds were starting to clear. Newt and Tristan insisted that we take advantage of the weather and make the trek up to Mt. Moore, the summit of the nunatak. Deirdre and I exchanged glances. I knew we were both tired from opening and just wanted to take a break. But here we were standing in the middle of the icefield with hopes of blue sky above us; how could we not take the opportunity to see this beautiful place from a different perspective? So up we went, and boy was it worth it. At the summit, the sun was shining bright above and the clouds were flowing over the peaks below us like a river. I had never seen anything even close in comparison to the views that day. It was ethereal, everything below us was moving so fluidly, an important part of this natural system that happens every hour of every day, regardless if anyone is there to see it or not. It was in this moment that I felt the true magic of Camp-8. In the rest of our time at Camp-8 we summited Mount Moore twice more, each time different from the last. Newt Krumdieck overlooking the cloud-covered icefield from the summit of Mount Moore. Photo by Kenzie McAdams. The magic didn’t stop once we came down from the summit. That evening we made cornbread waffles with barbeque chicken and roasted potatoes, played Settlers of Catan, and shared chocolate brownies right out of the tin with a couple of forks. We became fast friends with Lucifer, the heating unit that warmed the whole room, and learned all about the tradition of “RASHing”. We were trained on the radio, learning how to keep the radio log, understand the lingo, and what the importance of radio communication meant to JIRP. Whether it be the back and forth between Juneau Base to Camp-8 and Camp-8 to Camp-18 trying to relay weather information to get a helicopter in that day, or the happy-go-lucky trail parties calling in for their daily check-ins, the success of JIRP hinges on this radio system. Although we had an important duty monitoring the radio, in the true spirit of JIRP we didn’t stop exploring. Our remaining time at Camp-8 was spent exploring the bergschrund on the side of the nunatak, (or more fondly know as “the ‘schrund!”), mastering our tele turns on the hill and rappelling into the snow crevasse that opened up near camp overnight, always to return to warm waffles waiting for us at camp. Kenzie Mcadams sharing the view from inside the Camp-8 crevasse. The opportunities for exploration and growth are endless on the icefield; each camp, each traverse and each conversation has its own unique type of magic. After reading all of the writing on the walls and chatting of the JIRPers before us, we left Camp-8 knowing that we were joining the ranks of those JIRPers who got to experience this magical place. 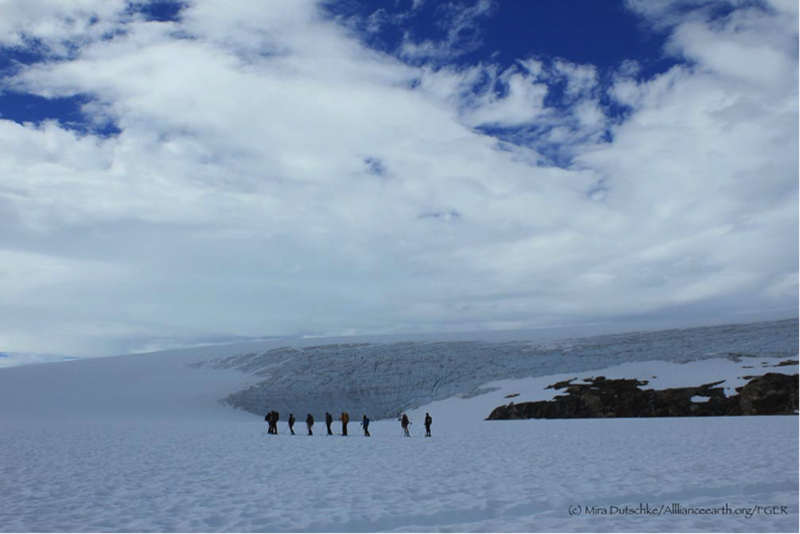 At Camp 10 there were many different ways to spend free time: enjoy the great views from the deck, read, work on science project proposals, cook and eat food… or you could take a field trip exploring what we usually spent considerable effort avoiding: the inside of a giant crevasse! (Note 1: Dear parents reading this blog, please do not worry; this was a completely controlled undertaking, supervised by our outstanding and experienced safety staff. Note 2: Kids, don’t try this at home.) Finally we got to use the great outdoor skills we learned in the safety course of Camp 17 by rappelling into a crevasse associated with a feature called “The Blister”. Why would someone want to lower themselves into a giant, water-filled ice crack? For one, it is a great way to see the annual accumulation of snowfall. Annual layers of accumulation are exposed in the crevasse, without having to dig a giant snow pit. Secondly (and most of all), it is really great fun.